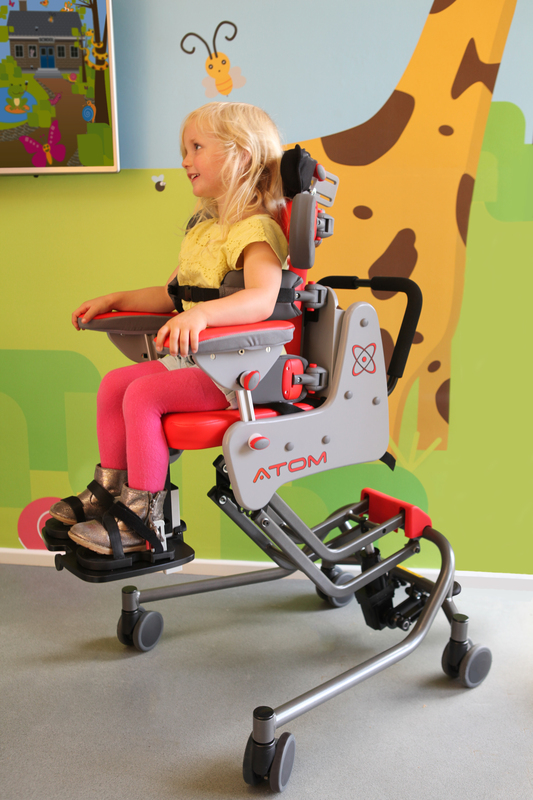 Modern, child centred styling combined with a comprehensive range of support options make Atom the ideal seating system to give children with additional postural needs the right amount of support to develop correct seating posture and function. Wipe clean covers as standard mean any messy play or other soiling can be easily cleaned; antimicrobial agents in the covers give additional peace of mind when Atom is placed in a multi-user environment. Recognising that children grow and develop at the quickest rate in their infant years, all support structures are easily adjusted, added or removed. This ensures each child is getting the correct support at any given time and can accommodate changes in their postural needs. All trunk positioning accessories are optional and are intended to offer just the right level of support. Consider the High-rise Thoracic Support Pads where minimal lateral prompting is required or combine these with one of our Waistcoat Harness’s to provide complete proximal support. The High-rise Flexible Thoracic Support Pads work like a pair of hands to mimic the feel and control of holding a child in a corrected position and come in a number of different lengths to accommodate children of different body shapes. With a number of different control options, windsweeping, abduction and adduction can be easily influenced or controlled using our standard leg positioning accessories. Consider using the Leg Control Pads in conjunction with the Fixed Angle Footplate and Sandals to create an abducted leg position to aid with promoting good hip health. Alternatively use the easy to attach Long-leg Sitting Board to provide either a more stable platform of support for the upper body in children with small femoral length or to promote a good hamstring stretch. 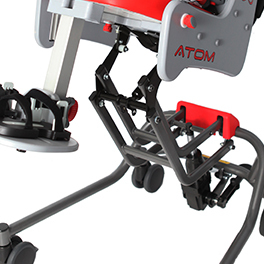 Recognising the importance of effective foot positioning the Atom has the choice of two different footplate options. 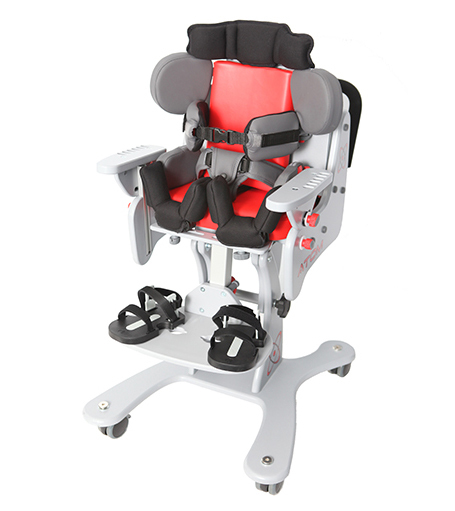 Use either the Fixed Angle Footplate which offers a wider platform for seating in abduction or the Flip-up Angle Adjustable Footplate with angle control for children who require plantar or dorsi flexion control. The child’s feet can then be precisely positioned using a number of standard accessories, Sandals, Sandals with Ankle Snugs and not forgetting our innovative Booties which offer gentle positioning for the smallest of feet. Alternatively where such precise positioning isn’t needed consider using the comfortable padded Footplate Pad. Use the Y base (now available in 3 colours) where you want the ultimate access to your environment, low enough to access nursery (kindergarten) height tables and high enough to comfortably sit at the dining table or breakfast bar at home. All height adjustment is done with our safe and simple foot operated pump mechanism. 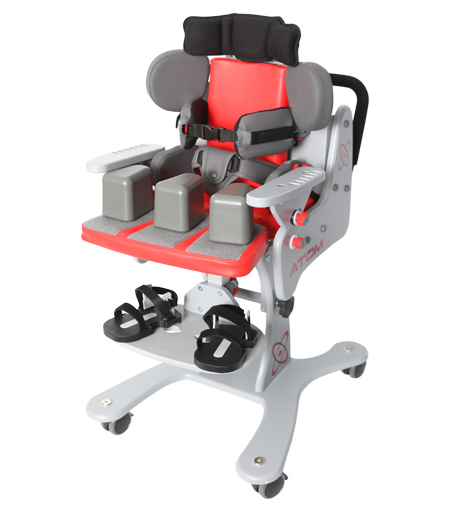 Consider utilising the wide range of tilt-in-space and setting the seat the best height for each transfer in and out of the product to maximise safe transfers for everyone. 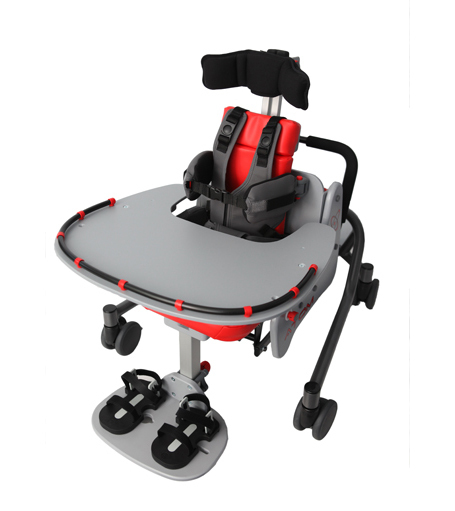 Even our simple bases come in two different heights to offer the best access to the required environment, Low for peer group interaction at home or nursery (kindergarten) and High for interacting with adults at the dining table – both offer tilt-in-space for easier transfers and supporting tired heads. No more hunting around for the right sized Allen key or wrench! 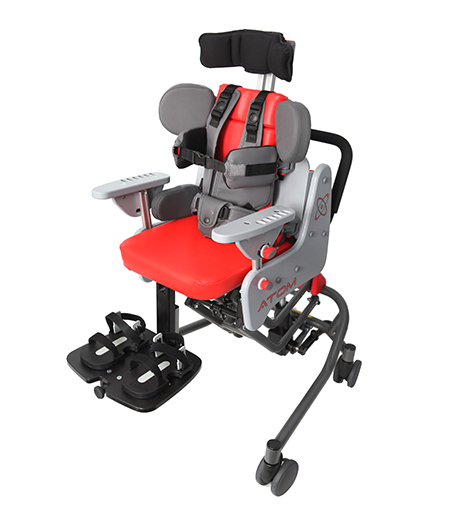 Simply loosen wing knobs or operate the button release mechanisms to make those fine tune adjustments that make Atom the easiest to use seating system on the market. 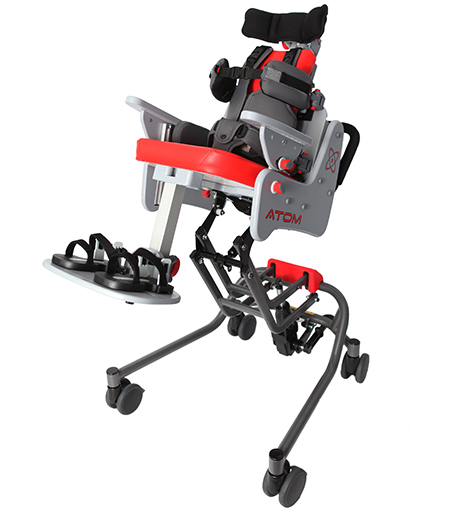 An ideal solution in multi-user environments, with Atom quickly and easily adjusted between different children. 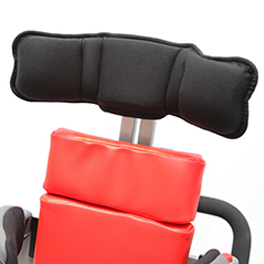 The original and innovative Jenx Multigrip™ Headrest is available in 3 sizes for all Jenx seating systems. 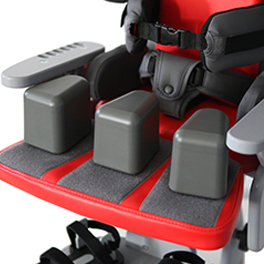 All Jenx Multigrip™ Headrests have a choice of various highly flexible fixing brackets, all of which give adjustment for height, depth and angle. A simple headrest offering mild mid-line contouring for children who require minimal head support. Comes as standard with the Atom seat unit, a removable back pad to provide room for growth made from wipe-clean antimicrobial fabric. Comes as standard with the Atom seat unit, a comfortable, contoured back pad made from antimicrobial fabric for easy cleaning. Simply attach into place by hook and loop fastener to give additional lumbar support. A 50mm backpad to reduce the seat depth for smaller children. Simply attach by hook and loop fastener into place behind the standard 25mm back pad - easily removed when no longer needed. Comfort style shoulder protractors to encourage a functional mid-line hand position and prevent excessive retraction. Completely flip-away when not required. Independently adjustable for width and angle. These short, slim trunk support pads are made from flexible and hygienic PU. 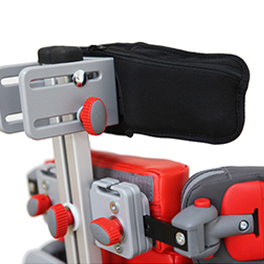 There is a single handed push button flip away action on all supports and they are independently adjustable for height and width. Can be offset to brace a scoliosis or accommodate other skeletal deformities. Available in a range of sizes (short/standard/long), these slimline and super flexible support pads (with straps) are designed to provide outstanding positioning with comfort in mind. All sizes feature single handed flip-away action and are independently adjustable for height and width to ensure maximum trunk control. Included as standard with the Atom seat unit. Adjustable in height, width and angle, ideal for promoting an abducted seating posture if required. Provides additional pelvis control by allowing a more tailored pelvic position. Use in conjunction with the Lumbar Pad to ensure an anterior tilt on the pelvis. 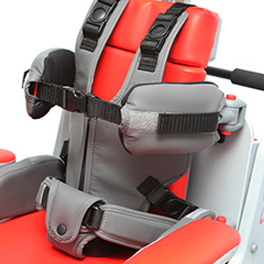 Dual lapstrap with the additional safety of a groin harness. Ideal for smaller users. 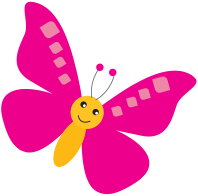 Provides additional trunk support to children with low tone. An innovative zip system allows for easy access to gastrostomy feed tubes, with outer surface made from wipe-clean fabric. Perfect for controlling leg positioning. Each leg is guttered in a soft, adjustable cup which can be adjusted for width and angle. Ideal for controlling windsweeping or creating an abducted seating position. Easily attached and removed with just 2 wing knobs, the Long-leg Sitting Board can be used permanently or intermittently for very young children or those needing hamstring stretch. Adjustable support blocks attach by hook and loop fastener. All other settings remain unchanged making the change from regular to long leg sitting quick and easy. Available in 2 sizes, the abduction block is ideal for creating a separation between the knees to prevent abduction. Available in white or grey and provided as a pair, the armrests are independently adjustable for height and angle. Clear markings make it easy to set the armrests at the correct height. Armrests are required for using a tray. Provide a soft top for the armrest cover for when the tray option is not required. Easily removed for times when tray is required. Available in blue, pink, green, red or yellow. A useful surface for work, feeding or play, made from antimicrobial plastic providing a hygienic and easy to clean surface. Contrasting tray edging gives a definitive boundary particularly useful for children with visual impairments and is also raised to allow toys or other items to be securely fastened in place. It’s also available with reduced cut-out for babies and small children. NB: Suction toys, anchors or grab bars will not work with this tray – to use these items with the Atom please see the Nursery Tray Infill. Designed to work with the Nursery Trays to reduce the aperture for smaller children. Perfect surface for use with suction toys, anchors or grab bars. Prevents even the slimmest of arms from falling into gaps. Provides total surface padding for the tray, ideal for users who are prone to injuring their arms on support surfaces. Great for providing a comfortable resting surface for elbows, padding half of the tray closest to the user. Great for encouraging head control and hand/eye co-ordination. Easy to attach and adjust. Comes with two clips for attaching toys or other items. Effortlessly flips away to aid in transfers. Ideal for where plantar or dorsi flexion accommodation is required. 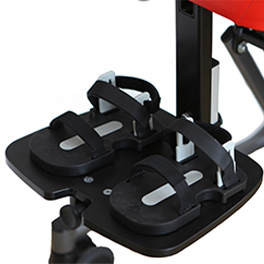 An effective footplate which allows Sandals to be positioned further apart for abduction when using the Leg Control Pads. Attach to the Footplate to give a softer surface for children who don’t require a more structured foot positioning. Available in 2 sizes, Sandals are ideal for positioning feet where a firmer hold on the foot is required. 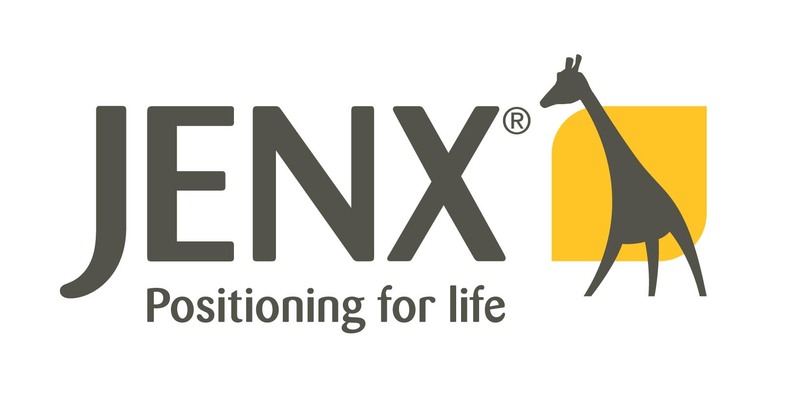 Jenx Sandals are interchangeable across the entire range of Jenx seating and standing products. An optional foot accessory to the standard Sandals, the Ankle Snugs offer a unique magnetic buckle fastening mechanism, which can be operated single-handed. Booties provide gentle and comfortable support for tiny feet even without shoes. They are soft and padded with no fiddly straps, press studs or buckles. Available for every size of Jenx Sandals, the raising block kits give the Sandals extra height where needed. Use to accommodate leg length discrepancy or use to raise the height of the footplate on any product to maximise the available growth. NB: One kit needed per individual Sandal. The most flexible base in the Jenx range, the Y-Base offers a height range of 285-750mm alongside tilt-in-space functionality and lockable, swivel castors. Tilt-in-space 30° posterior – 10° anterior. Available in grey, white or black. The grey Wooden High Base for the Atom seating system offers fixed height seating (550mm) which is compact, economical and stylish. It features lockable swivel castors and tilt-in-space 20° posterior. The grey Wooden Low Base for the Atom seating system offers fixed height seating (400mm) which is compact, economical and stylish. It features lockable swivel castors and tilt-in-space 20° posterior. Provide a soft top for the armrest cover for when the tray option is not required. Easily removed for times when tray is required. Available in blue, pink, green, red or yellow. A 50mm backpad to reduce the seat depth for smaller children. Simply attach by hook and loop fastener into place behind the standard 25mm back pad – easily removed when no longer needed. Available for every size of Jenx Sandals, the raising block kits give the Sandals extra height where needed. Use to accommodate leg length discrepancy or use to raise the height of the footplate on any product to maximise the available growth. NB: One kit needed per individual Sandal. A useful surface for work, feeding or play, made from antimicrobial plastic providing a hygienic and easy to clean surface. Contrasting tray edging gives a definitive boundary particularly useful for children with visual impairments and is also raised to allow toys or other items to be securely fastened in place. It’s also available with reduced cut-out for babies and small children. NB: Suction toys, anchors or grab bars will not work with this tray – to use these items with the Atom please see the Nursery Tray Infill.